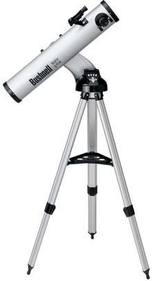 Reflector telescopes are also known as Newton telescopes, reflecting telescopes or reflectors. As Isaac Newton invented a telescope that worked with a mirror, his telescope was called a reflecting or mirror telescope. This telescope gradually began to be named after its creator. 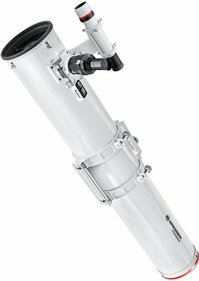 The biggest plus of a reflector telescope is the price/quality relationship. 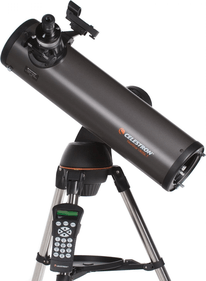 A Newton telescope will buy you more observing performance than any other type of telescope. 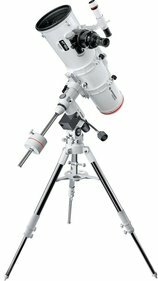 The biggest plus of a reflecting telescope (Newton telescope) or reflector is the price/quality relationship. 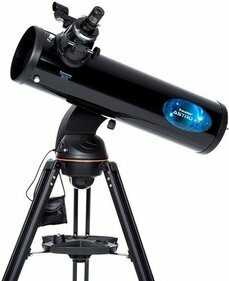 A Newton telescope will buy you more observing performance than any other kind of telescope can give you. 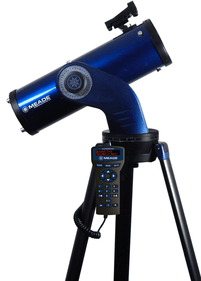 The large light collecting area and the relatively short focal length of the reflector provide you with incredibly bright images of far-away space objects. These objects would be too vague and thus hardly visible with a small refractor. 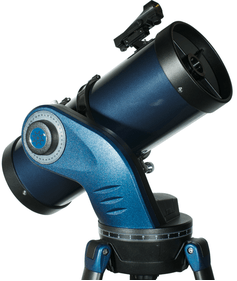 The large aperture of the reflector telescope is able to show details on objects with a precision that smaller telescopes are not able to achieve. Mind you, this only applies when viewing conditions are favourable. A disadvantage is the bulkiness of this telescope. This, however, does not mean that the mirror telescope is expensive. A reflector costs the least per inch of aperture of all telescope types. The reason? A reflecting telescope only needs one mirror to arrive at the right angle (with an accuracy of approximately five one-millionths of an inch or maybe even more). A refractor, on the other hand, has two to four lenses. These lenses are often made of expensive exotic glass, the type that ensures that you get very bright and sharp images. A catadioptric telescope has three or four curved optical elements to get a similar degree of accuracy. Grinding mirrors and lenses, expensive optical glass types in refractors and catadioptric systems: all in all quite expensive as you can imagine. Needless to say, a single curved flat mirror is cheaper to manufacture. 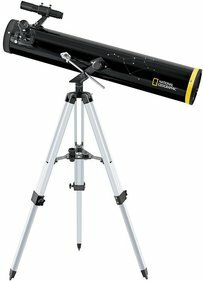 Buying a mirror telescope means more aperture for your money. The bigger the aperture, the better the performance! 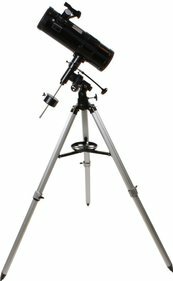 An 8 inch reflector is 50% cheaper than a good 4 inch refractor and just a little bit more expensive than a 3.5 inch catadioptric telescope. However, it will gather four times more light than the refractor and the catadioptric telescope. For deep space observing a Dobson reflector telescope is very cost-effective. 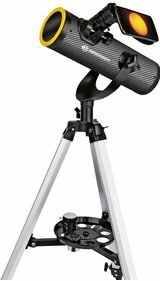 With large mirrors (up to 24 inch in diameter) to gather light and inexpensive wooden mounts, these new Newton telescopes have introduced the so-called ‘light bucket’ in the world of amateur astronomy. 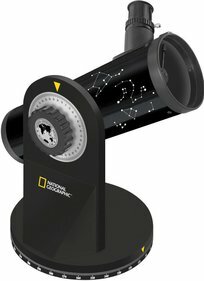 This budget telescope which is able to peer far into space is a very popular telescope indeed! 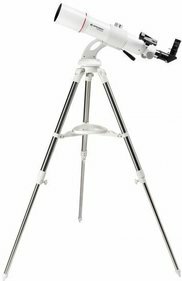 Astrophotographers will absolutely love this big equatorial mount reflector of large aperture that is able to observe and record details deep in space (photography is not an option with an alt-azimuth Dobson reflector). or light scattered by the diagonal mirror of a reflecting telescope may reduce contrast when you are observing the moon and planets. As a result, subtle details are obscured. This is not the case with a refractor which offers unobstructed images. In addition, diffraction spikes on images of double stars are covered and globular cluster details are smeared. Because of the shape of their mirrors all reflectors suffer from coma. Coma is an optical defect which makes stars look triangular or wedge-shaped on the edges of your field of view. The faster the focal ratio, the smaller the coma-free field. This can be exasperating when taking pictures with a large field of view. Yet you rarely see this defect with the naked eye since interesting objects are usually located in the middle of your field of view where eyes and eyepieces are sharpest and coma does not really occur as such. 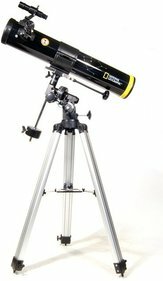 As an 8 inch Newton telescope weighs 50% more than an 8 inch catadioptric telescope and the 48 inch long optical tube takes up a lot of space, a giant reflector is not really ideal when you do not have a proper storage facility in your house. In addition, light pollution in the city does not benefit deep space observation at all. This is why it is always better to observe under a dark sky when using medium-sized or large reflectors. 12”-16” and bigger reflectors require a big car or a minivan for transportation as people to help you carry and assemble the components. 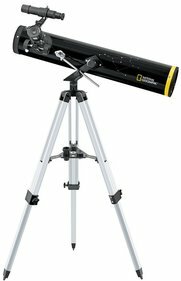 All in all, owning a large reflector telescope is more of a way of life than a hobby. A Newton telescope also needs regular maintenance. The exposed mirrors need to be cleaned, for example. Yet cleaning the reflector usually only takes a few minutes per observing session. 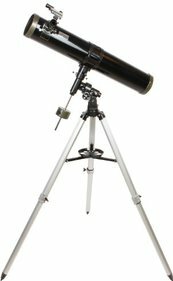 In spite of these disadvantages, we can truly recommend a reflecting telescope or mirror telescope when you want to observe far-away galaxies and nebulae as well as moons and planets. The great price-quality relationship is also a big plus, of course! Not for nothing have reflectors been selling well for over 300 years..